I’ve just about tuckered myself out going on and on and on in praise of Netflix. Safe to say, I think it’s a brilliant service. Nonetheless, there are a few niggling oddities in the system — mostly hangovers from the company’s previous life as a DVD mailout service — that strike me as odd. The most obvious is their continued operation of DVD rental in the States, an absurdly archaic practice that they sensibly did away with when they began expanding internationally a few years ago. 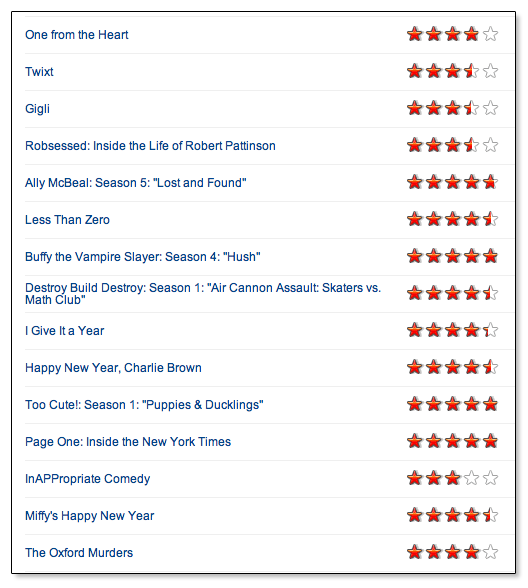 But equally worthy of reconsideration is an altogether more inconspicuous part of the Netflix experience: star ratings. LoveFilm’s entire interface seemed to be based on locating the best film available, and shoving it down your throat. Now is it just me, or is that precisely the opposite of what a streaming service should provide? Unlike a video rental store, where your £3.49 buys you a single film and therefore you have a certain amount invested in it being good, streaming services don’t call for deliberation. You can try out whatever you like, whenever you like, and for as long as you like. You might stumble upon something brilliant or you might not, but the level of commitment required is so small that it hardly matters. It’s a bit like watching a film on a plane: All rules are off, and the adventurer within each viewer is unleashed. 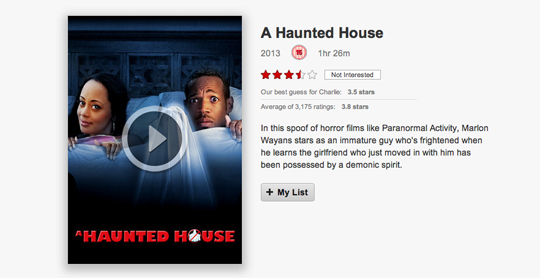 Netflix is exceedingly good at not discriminating between its ‘high-brow’ and ‘low-brow’ films. Scroll through a selection of horror movies and you’re just as likely to come across The Human Centipede II (Full Sequence) as you are Rosemary’s Baby. So it seems anachronistic that they still insist on branding everything with an indication of its supposed quality. What kind of feeble mind would eagerly load up Gaspar Noé’s three-hour psychedelic mess-terpiece Enter the Void only to renege at the last minute due to its two-star rating? Has anyone ever thought, “well, InAPPropriate Comedy looks like the worst art ever created by a human being, but I guess it can’t be all that bad if it has three stars on Netflix”? Don’t get me wrong — I think people should be free to watch InAPPropriate Comedy as many times as they choose. (I’ve seen the inexplicable Lindsay Lohan framing device three times already.) But let’s not kid ourselves: the joy of a film like that — and the joy of most of the good, bad and impossibly ugly stuff on Netflix — is that it doesn’t matter how good it is, it only matters that it’s there.